As writers, we are told to “write what you know.” Which is a pretty nifty trick when you consider that we — as funnybook writers — write about green-hued monsters, men from other planets who can fly, billionaires wrapped in Iron, ageless mutants with razor-sharp claws, brilliant scientists with the proportionate strength of an arachnid, and yes, even pre-teen girls who morph into killer werewülves. Yeah, like we know a whole bunch about all that, eh? Well, the sad truth is that while we don’t really know so much (or as much as we would like) about having powers and abilities far beyond those of mortal men, we do each know quite a bit about the everyday ordinariness of our own lives. Well, taking this lesson to heart, writer, artist, and publisher Joe Martino determined to write about the one thing he perhaps (and unfortunately) knew best. Joe, as it turns out had cancer — twice. That’s the bad news; the good news is the he beat it both times it showed up in his body, but at a very terrible cost. Cancer you see, not only cost Martino his peace of mind as well as a couple sections of his kidney, but his first marriage as well. Needless to say, there were quite a few very dark days for Martino during that terrible time. Still — to corrupt a cliché — the thing that did not kill him actually helped make him a much stronger writer. Martino found a way to turn his personal journey through the Hell of cancer into his teen-aged passion for comicbook superheroes. As a teen he discovered the joy of comics and as an adult he turned that escapist entertainment into a way to work his way through his own pain. His first couple of forays into comics took the forms of a hero that tread the ground between this world and the next (Ripperman), and a traditional superhero replete with powers from an alien race (Shadowflame), both of which were published by Arcana. 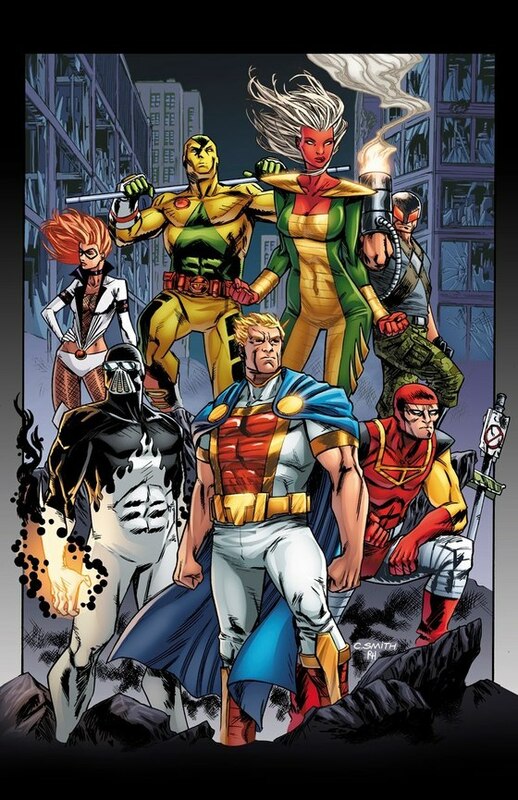 From there, Martino determined that he wanted to continue producing comics, but decided that he wanted to publish them himself and created JGM Comics, which became the home of his latest creation, The Mighty Titan. 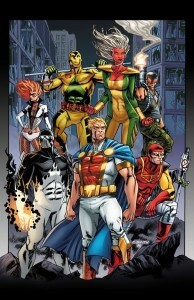 Starting in April 2013 Martino formed a publishing partnership with publisher, Dave Ryan and brought his creations to Red Anvil Comics. The Mighty Titan is a typical superhero cut from the same cloth as are the best of costumed heroes. He is the pinnacle of the pantheon of those heroes, like Philip Wylie’s Gladiator, or Henry W. Ralston and John L. Nanovic’s Doc Savage. Titan though, is replete with powers and abilities akin to those of Superman, the regal presence of Thor, along with the magic of Captain Marvel. Then, so as not to overuse the Metro New York locale, Martino determined to cast his hero in a different zip code, and he had his hero call Chi-Town his home. That’s right, even though Martino is a New Jersey native he felt that Manhattan had enough heroes protecting it, so, Chicago became Titan’s kind of town. Just as every good hero needs his own major nemesis, Titan finds himself clashing over and over again with Trenchmouth, an evil ex-Nazi scientist. During one particular battle, however, Titan realizes he doesn’t quite feel like himself, which is where our story begins. 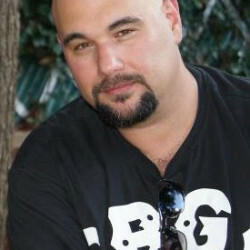 Martino initially developed the idea for the series in 2004 when he was struggling through his first bout with kidney cancer. “It was a very difficult decision to take some of my personal experiences and put them down on paper in order to entertain people and possibly allow them to have a glimpse into what some of us go through while battling this potentially deadly disease,” Martino explained. Needless to say while Titan’s story most assuredly does have some very serious aspects to it, it is still a very cool — and yes, even fun — superhero comicbook that is full of dire villains, giant mechas, as well as some truly great mythological creatures. What Titan experiences is in Martino’s words, “What it feels like to be invulnerable, and then, suddenly never being able to feel that way again.” The Mighty Titan is suddenly tasked with not only having to be able to save the world; but needing to be able to save himself as well. According to Martino, the book explores themes of fear, loss, pain, and ultimately the perseverance of the hero himself due to courage and determination. Titan is a hero of great power and strength, but he is also cast as someone who reminds us that we all have great weaknesses, and that we all can be destroyed. Still Titan (and by extension, Martino) also provides us all with great hope. For it is when we feel at our weakest, when we’re not sure whether or not we can make it through our darkest hours, it is uplifting superhero tales like this one that remind us that we can be saved, and that hope is not lost. Characters, Story and Content of The The Mighty Titan are , Ripperman and Shadowflame are Trademark ™ & Copyright © 2014 Joe Martino. The text to Funnybook City is Copyright © 2014 Robert J. Sodaro, D.B.A. Freelance Ink. All rights reserved by their respective owners.